Bordering to the north with both the Republic of Mongolia and Russia, is the widest province in China. The Province has a peculiar natural scenery, long history and brilliant culture, and the most attractive places of historic interests include the Wudangzhao Monastery in Baotou, a vast complex and used to be the residence of the highest ranking lama, Dazhao Temple, one of the biggest and best-preserved temples in Hohhot, Wanbu Huayanjin Pagoda, also called the White Pagpda, used to be a place where nearly ten thousand volumes of Huayan Scripture, and much more. However, what is most impressive about the region should be the natural beauty: vast grasslands, the mushroom-like yurts, bright sky, fresh air, rolling grass and the flocks and herds moving like white clouds on the remote grassland. Besides, the most famous and visited deserts in this region are the Badain Jaran Desert, Tengger Desert and Kubuqi Desert, and the tourists can enjoy the graceful Mongolian singing and dancing, horse and camel riding, rodeo competitions, archery, the traditional family lifestyle. 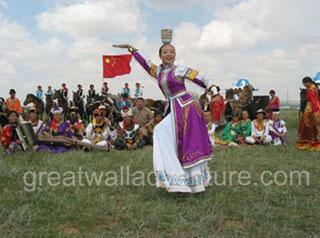 Inner Mongolia is largely steppe country that becomes increasingly arid toward the Gobi Desert in the west. The climate is continental with cold dry winters and hot summers. Stockraising, mainly of sheep, goats, horses, and camels, is a major occupation; wool, hides, and skins are important exports. Rainfall is scanty, but irrigation makes agriculture possible, and much grazing land has been converted to raising spring wheat. The main farming areas are in the bend of the Huang He (Yellow River) and in the Hohhot plains. The Mongols of China are concentrated in the Inner Mongolian Autonomous Region, but there has been much Chinese immigration and the Mongols now comprise less than 20% of the population. The Chinese live mostly in the farming areas. Many of the traditionally nomadic Mongols have settled in permanent homes as their pastoral economy was collectivized. Inner Mongolian Univ. is in Hohhot.